This marks the eighth year for what has become one of the most highly regarded events on the West Coast summer music festival circuit. The Petaluma Music Festival takes place on Friday, July 31st and Saturday, August 1st, 2015, at the Sonoma-Marin Fairgrounds & Event Center in Petaluma. With past festival performances by national acts like Trombone Shorty, Galactic, The Devil Makes Three, Jackie Greene, and Xavier Rudd, festival goers are always treated to a family-friendly event with a unique variety of indie-band music for people of all ages. This year is no exception. Opening the festival on Friday night is a special concert with the jump swing and jive of Big Bad Voodoo Daddy. Featured in the film “Swingers” and performing the half-time show of Super Bowl XXXIII are just a few of the many accomplishments of this retro-hip big band known for getting audiences on their feet and dancing. The Friday night VIP ticket option includes reserved seating with a four-course gourmet dinner and complimentary wine and beer. One of three headliners for the 2015 Saturday Festival is the tribal hip hop/folk of Nahko and Medicine for the People. Led by the charismatic and dynamic Nahko Bear, the group was borne out of Nahko’s desire to produce a musical journal of his journey toward personal, spiritual, and social healing. Also co-headlining are The Wood Brothers. Chris (formerly of Medeski, Martin & Wood) and Oliver are two brothers who decided to form a band, adapting the blues, folk and other roots-music sounds they loved as kids into their own evocative sound and twining their voices in the sort of high-lonesome harmony blend for which sibling singers are often renowned. The third co-headliner is jam rock band ALO. With their delightfully vibrant blend of inventive musicality and genre-blurring reach, ALO performs their always-kaleidoscopic funk pop-n-roll with exceptionally ebullient songcraft and deliriously danceable grooves. Rounding out the Saturday lineup are the afro-samba-funk-dance music of SambaDá, the stomp folk of the Rainbow Girls, the high-energy traditional jazz of The Dixie Giants, the americana rock of Midnight North featuring Grahame Lesh, the roots rock of The Coffis Brothers, the country and western sounds of Buck Nickels & Loose Change, the R & B soul/rock of Dylan Chambers and The Midnight Transit, the reggae and Cali dub rock of Lumanation, the alternative rock of Bellygunner, the blistering blues and soul of Twice As Good, the americana folk of singer-songwriter Jenny Kerr, and the country rock/blues of Arizona & The Volunteers. Also featured on Saturday are a silent auction, a celebrity autographed guitar raffle, a kids area, free drinking water, and a variety of specialty food, craft, and merchandise vendors. The presenting community partner is the Lagunitas Brewing Company. 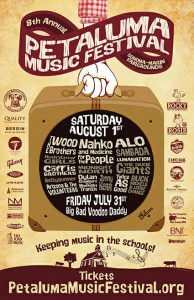 The Petaluma Music Festival is a 501(c)3 non-profit organization dedicated to “keeping music in the schools.” All festival proceeds benefit the music education programs in all Petaluma area public schools. In the last 5 years, the Petaluma Music Festival has donated over $125,000 to keeping music in the schools, and they are looking to increase that number in 2015. Saturday tickets are $40 General Admission and $85 VIP (includes shaded reserved seating with complimentary wine, beer, and light appetizers). Friday tickets to Big Bad Voodoo Daddy are $35 General Admission and $115 VIP. On both days, children 12 and under are free with a paying adult, and students 13-17 can purchase $20 tickets at the door. Ticket prices will increase on both days of the festival. Tickets are available for purchase online at www.petalumamusicfestival.org and in person at McNear’s Restaurant in Petaluma, the Lagunitas TapRoom & Beer Sanctuary in Petaluma, People’s Music in Sebastopol, and the Last Record Store in Santa Rosa. The Friday VIP Dinner seating starts at 5:00 PM and will begin serving at 5:30 PM. General Admission gates will open at 6:45 PM and the concert will begin at 7:30 PM with no opening act. Saturday gates open at 12:00 PM and the festival concludes at 9:00 PM. The festival location is the Sonoma-Marin Fairgrounds, 175 Fairgrounds Drive, Petaluma, CA 94952.